When 18-year- old Becky Andrews is diagnosed with the degenerative eye condition Retinitis Pigmentosa—characterized by poor night vision and a complete lack of peripheral vision—she finally understands her childhood challenges of softball strikeouts, notorious clumsiness, and why she’s never been able to see the stars. As her vision narrows, she must give up driving and accept her need for a mobility cane. In the process, she learns to embrace her new identity as a blind woman, one step at a time. Undeterred by the certainty of eventual blindness, Becky adopts a proactive approach to creating a life of purpose and joy. Becky’s remarkable story of living life to the fullest is a journey of courage and determination. Part memoir and part resilience manifesto, Look Up, Move Forward will inspire readers to face their own lives with more creativity, grit, determination and joy. **The book is also available in Large Print. Please indicate at purchase if you'd like a Large Print copy. Also available through Audible, Kindle, Nook, and BookShare. 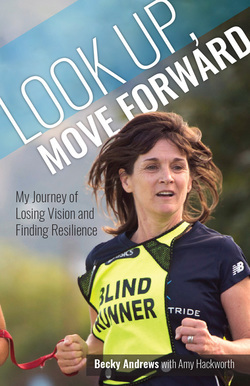 Becky's remarkable story of living life to the fullest is a journey of courage and determination.